Because we strive to give students the ideal balance of support and challenge at every stage, Lower School students, who range in age from five to 11, advance through school in a manner in which our curriculum is adapted to a child’s needs at any given time. We group students according to age, emotional development, academic abilities, and social compatibility. Reading and Math groups are based on academic strengths, learning styles, and instructional needs. Lower School faculty members draw from their knowledge of traditional and special education methods as well as their own experience to create individualized, effective academic programs. With art, music, drama, and technology projects integrated across the curriculum, students are able to express themselves through multiple means and take pride in their special talents. 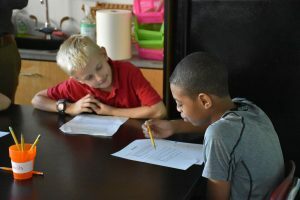 As our Lower School students become more independent, self-aware, and self-assured, they prepare for the growing expectations of Middle School. Click here for more information about the Stephen Gaynor Lower School core curriculum.